The QMC Reports are applicable references to a QM system that is based on a VDA standard. Regulations in the hitherto published QMC Reports, which are addressed in this volume, are no longer applicable as from the date of publication of this volume. From the January 1st, 2017, this 6th edition replaces the 5th edition of the Volume 6 "Basis for quality audits - auditing and certification" from 2008. From July 1st, 2017 at the latest, all 3rd-party audits according to VDA Volume 6 Part 1, VDA Volume 6 part 2, VDA Volume 6 part 4 will be carried out according to this 6th edition. 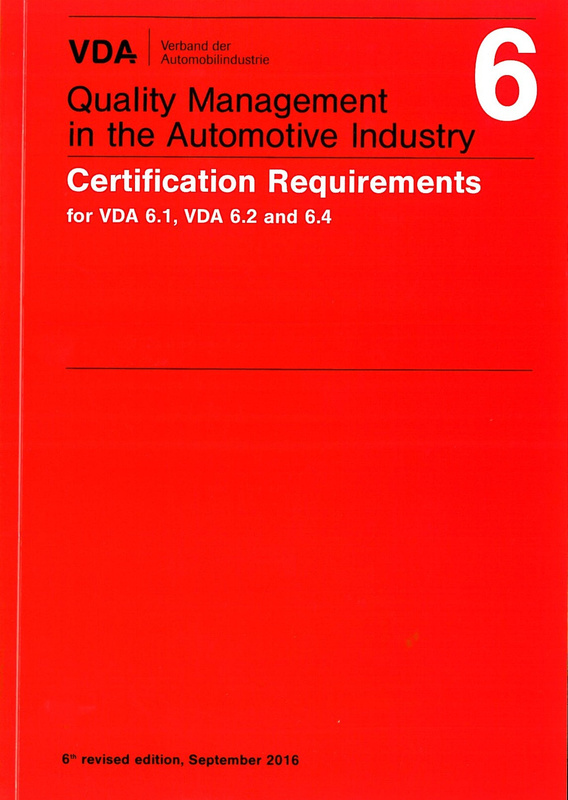 In this edition, the certification requirements are given for VDA Volumes 6, Part 1, VDA 6, Part 2 and VDA 6, Part 4, (also referred to as "VDA 6.1, VDA 6.2, VDA 6.4 or VDA 6.x standards"). The requirements for certification bodies are set out in ISO/IEC 17021. ISO/IEC 17021 is therefore applicable for the VDA 6 standards and defines special or further requirements for VDA 6.1, VDA 6.2 and VDA 6.4. These requirements are to be met in respect to the VDA 6.x certificates. The evidence of the fulfilment of the requirements from one of the respective VDA 6.x standards is shown by a VDA 6.x certificate. These regulations (SI/FAQ including the examples for audit day calculation) will be made available on the VDA QMC homepage after publication of this volume and will be binding from the date of publication.